Even though the Arizona drought of 2006 left the Sonoran Desert dry, brown, and almost wildflower-free, spring butterflies like this Great Purple Hairstreak (Atlides halesus) have still managed to emerge into this hostile environment. Great Purple Hairstreaks have brilliant metallic blue dorsal wings surfaces that flash like mirrors in the sunlight, but these beautiful butterflies are frustratingly modest and keep their wings closed when not flying, revealing only their duller, gray-black ventral wing surfaces. 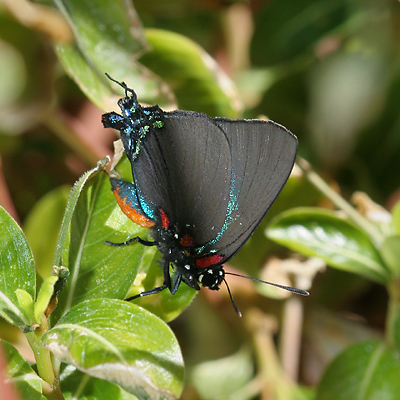 Hints of the hidden iridescent glory of its dorsal wing surfaces can be seen on this Great Purple Hairstreak's hindwing tails. Even though only a few flowers were blooming in my Tucson, Arizona garden, this lovely butterfly darted happily around my yard, stopping for brief moments to sip nectar from a few bedraggled blooms on my Madagascar Periwinkles (Catharanthus roseus). 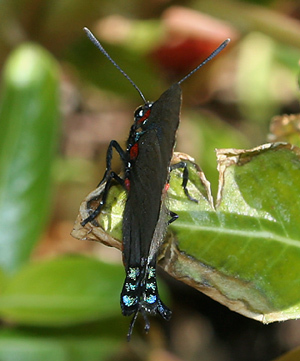 The Great Purple Hairstreak then flew up into my blooming California Pepper Tree (Schinus molle), where it disappeared among all of the other insects feeding on the tree's masses of tiny flowers. With scarce native wildflowers during drought years, many butterflies have to depend on cultivated flowers to obtain the nectar they need to survive. There will also be a drought-caused shortage of some larval host plants as well. Fortunately, Great Purple Hairstreak larvae feed on mistletoe (Phoradendron spp.) 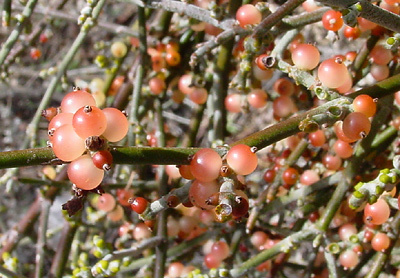 plants, and several species of these hemiparasites can be found on trees throughout the Tucson area. Mesquite Mistletoe (Phoradendron californicum) is abundant around Tucson, and it is covered in colorful berries during the winter and early spring. 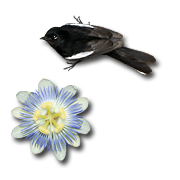 Because they tap into a tree's nutrients and moisture reserves, mistletoe plants are not much affected by short-term droughts, and there should be plenty for the Great Purple Hairstreak caterpillars to eat. It's the adults that are facing a famine if the lack of rain continues.